August 2, 2011  It's done. It's signed. And, at least for now, lawmakers can take a break from fighting over the debt ceiling. 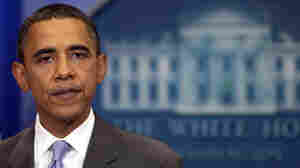 President Obama signed the legislation Tuesday afternoon. It raises the government's borrowing limit and cuts future spending. August 2, 2011  It's all over, it seems, but the voting. At midday Tuesday the Senate is expected to do what the House did Monday — muster a large bipartisan majority and pass a compromise bill to raise the debt ceiling, narrowly averting a first-ever default. August 1, 2011  After weeks of mounting anxiety and collapsed deals, President Obama and congressional leaders reached an agreement Sunday night to end the debt ceiling crisis. If all goes well, a bill could await Obama's signature Tuesday. But both parties still have concerns about the deal, and its support in Congress will be tested in coming days. July 29, 2011  The House has passed Speaker John Boehner's debt ceiling bill, while Senate Democrats move ahead on their own plan, which faces lumbering procedural hurdles. The irony, President Obama says, is that "the two parties are not miles apart." He adds that "the time for putting party first is over." July 29, 2011  Senate Democratic leader Harry Reid says it's the last chance to save the nation from default. NPR's David Welna talks with Mary Louise Kelly, about the developments on the negotiations after the House of Representatives postponed a vote on its bill last night. July 28, 2011  The Senate talks about how a compromise might still take shape between now and Aug. 2. July 28, 2011  Congress is still scrambling to vote on a deficit plan that could solve the current debt ceiling crisis. On Thursday, Speaker John Boehner is expected to present his plan for a vote in the House of Representatives. The Republican leader has called on his GOP brethren to get in line and support the proposal, while Senate Majority leader Harry Reid waits in the wings with a plan of his own. July 27, 2011  Despite the prospect of U.S. debt default if an Aug. 2 deadline isn't met, lawmakers continue to wrangle over competing proposals to increase the debt limit and cut spending. The House is working on a plan put forward by Speaker John Boehner; awaiting a vote in the senate is Majority leader Harry Reid's rival plan. July 25, 2011  The deadline is eight days away now, and there's real concern there may not be enough time for either proposal — or a compromise version of the two — to get enacted by Congress. July 24, 2011  The concern is that a Friday night breakdown in talks between President Obama and House Speaker John Boehner on raising the debt ceiling may have negative repercussions when trading gets under way in Asia. Meetings continued Saturday, but Obama reiterated his opposition to a short-term extension. July 23, 2011  Hill leaders have been invited back to the White House for more talks on raising the debt ceiling and averting default on U.S. obligations. What's The State Of Play In The Debt Ceiling Talks? July 22, 2011  The Senate Friday tabled the House's best shot at a debt reduction plan, the "Cut, Cap and Balance" bill conservative Republicans passed earlier in the week. But negotiators still seem far from a deal on the Senate plan, and President Obama continues to parley with Republican House Speaker John Boehner. Could Gang Of Six End Debt-Ceiling Stalemate? July 20, 2011  The plan would cut deficits by nearly $4 trillion over the next decade. Half the cuts would come from defense. Savings would also come from Medicare and Medicaid; tax rates would be lowered for individuals and corporations, and the alternative minimum tax would be abolished. Many tax deductions would be targeted in order to raise revenue. 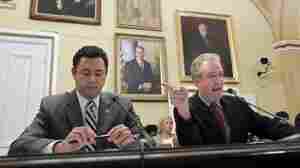 Could Gang Of Six Plan End Debt-Ceiling Stalemate? July 19, 2011  The Republican-backed legislation bars any increase in the debt ceiling unless Congress first passes a balanced budget amendment. It has little chance in the Senate, but it could clear the way for a bipartisan fallback plan to avoid default. July 15, 2011  As President Obama made his case on the debt ceiling and deficit crisis at the White House Friday, Republicans on the Hill were making theirs — and promising a series of votes next week to set out their plan for reordering the nation's finances.